If you’re reading this blog post, you can probably relate to how I felt when I launched one of my first online businesses. I was excited, optimistic, and scared all at the same time. Considering the Bootstrap framework was new and not everyone knew how to use it, I figured there was an opportunity to educate people through video tutorials. With that in mind, I turned to YouTube. Since launching the YouTube channel for BootsrapBay, we’ve generated more than 750,000 views with only 16 videos. In this post, I’ll walk you through the step-by-step process you can use to do the same. Everyone knows Google is the largest search engine in the world. What most people don’t realize is that YouTube is the second largest search engine in the world. Just like Google, YouTube serves video results depending on the keywords you search for. This makes keyword research incredibly important for generating views on your videos. You’ll notice that YouTube is suggesting “Bootstrap 3 tutorial”, “Bootstrap 3 grid system”, “Bootstrap 3 carousel,” and “Bootstrap 3 datetimepicker.” Right off the bat, we have 4 keywords we can create videos for. 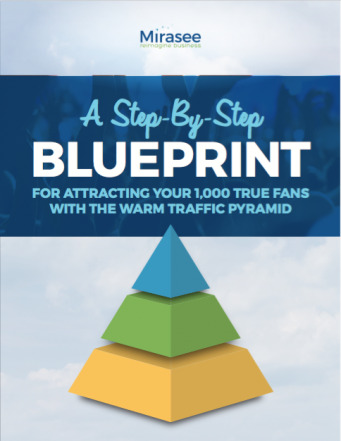 If you want to take this strategy to the next level, you can use a tool called KeywordTool.io. This tool will do the same thing we did above, but it will provide many more keywords. Finally, you can use the Google Keyword Planner. By entering your main keyword, the Google Keyword Planner will suggest a variety of different keyword ideas. Keep in mind that the Keyword Planner provides keyword ideas and search volumes based on Google searches, not YouTube searches. Therefore, it’s good to use this tool as a complement to your YouTube keyword research. 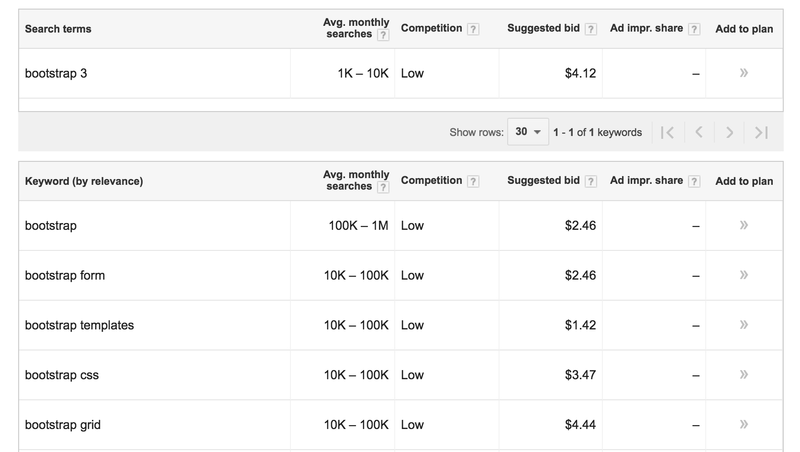 Don’t assume the data in the Keyword Planner will match search volumes in YouTube. For even more ideas on keyword research, check out these additional tips. Now that you’ve put together a solid list of keywords, you need to optimize your videos for the YouTube search results. The process is very similar to optimizing a blog post for Google search, but with minor differences. When it comes to optimizing your videos for search, nothing is more important than the title and description. Remember, YouTube has no way of detecting what your video is actually about, and so, it must rely on your title and description. First, make sure your main keywords are included in both the video title and description. Then briefly describe the contents of the video in the video description. Provide as much detail as possible to help rank your video for all the necessary keywords. 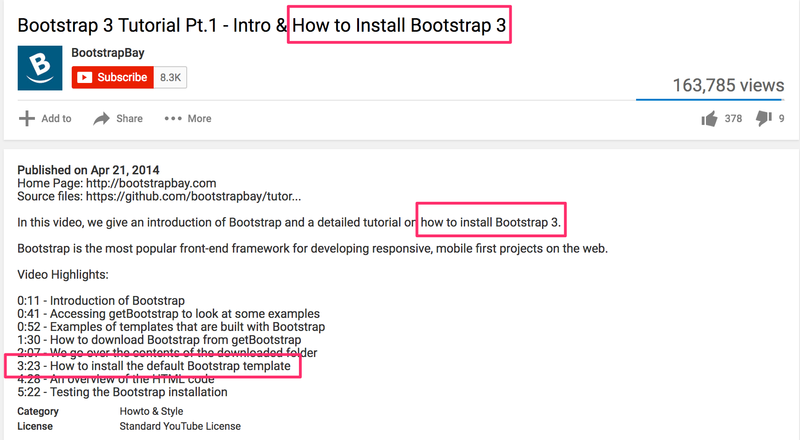 Here’s a screenshot from our video with the target keywords, “how to install Bootstrap 3.” Notice how many times we worked this phrase into the video title and description but in a natural, non-spammy way. If you’re shooting videos on your iPhone or creating them with a screenshare software like ScreenFlow, your video will likely be exported with some default name like “video-1.mp4”. It’s very important to rename your files before uploading them to YouTube. Include the keyword(s) in your file name, separated by either dashes or underscores. For example, if you were targeting the keywords “seafood salad recipe,” you could name your video file either “seafood-salad-recipe.mp4” or “seafood_salad_recipe.mp4”. 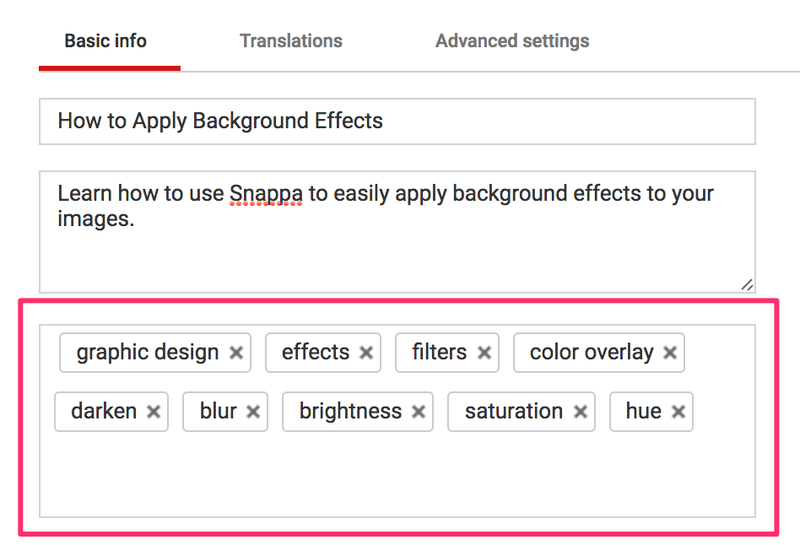 Last but not least, include as many relevant tags as possible in your video. These tags won’t be displayed to the public but YouTube will use them in its algorithm to determine when it’s appropriate to show your video in search results. Once you’ve performed the proper keyword research and you’ve optimized your videos for search, they should start showing up in the search results. Use proper dimensions: The optimal sizing for YouTube thumbnails is 1280px by 720px. Sticking to this size will ensure that your thumbnail looks great when your video is embedded on a web page. Include a title: Thumbnails take up a lot of real estate in the YouTube sidebar and social media feeds. Take advantage of this by adding text to the thumbnail to give the reader additional context and a good reason to click through. Ensure good contrast: The text on your thumbnail needs to be legible. Use light text on dark backgrounds or dark text against light backgrounds. Be consistent: Branding is essential in YouTube. Make sure all of your thumbnails use a consistent, coherent style so they’re easily recognizable to your viewers. If you’re not a graphic designer, don’t worry. You can use Snappa’s free thumbnail creator to make your own click-worthy thumbnails. Once a visitor starts watching one of your videos, you want them to keep watching more videos in your channel. One of the most effective ways to do this is through playlists. Without using a playlist, YouTube will show viewers a bunch of random videos once your video is over. However, if you organize your videos into a playlist, YouTube will show your viewer the next video in your playlist. This way, you keep viewers consuming your content instead of sending them to someone else’s videos. As social media continues to take over the world, our attention spans continue to decline. According to data from Statistic Brain, the human attention span has fallen from 12 seconds in 2000 to just 8 seconds in 2015. Sadly, this means humans have a shorter attention span than goldfish! 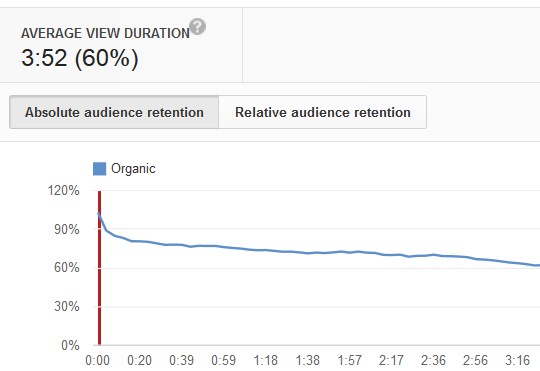 YouTube uses audience retention as a ranking signal when deciding whether or not to show your videos in the search results. So if your video fails to keep audience attention and too many people click away shortly after landing on your video, YouTube will stop showing your video to others. The easiest way to overcome this is to keep your videos as concise as possible. Unlike a blog post where it’s encouraged to create lengthy content, video is quite the opposite. Your video should be only as long as necessary for it to accomplish its objective. In our case, we split our Bootstrap 3 video tutorial into 16 different videos. Not only did this allow us to rank for separate keywords, it also made it way easier to keep our viewers’ attention. Imagine how hard it would be to sit through a 1+ hour coding tutorial all in one sitting! In your YouTube analytics, take a look at your video retention. If you find that viewers aren’t sticking around and dropping off really early, you’ll need to adjust the length of your videos. Now that you have new viewers coming to your channel, you’ll want to keep them coming back. Without a doubt, the most effective way to keep viewers coming back is by getting them to subscribe to your channel. Why are subscriptions so important? Each time you publish a new video, all of your subscribers receive a notification (as long as they haven’t turned off notifications). Just like tagging a friend on Facebook, push notifications on YouTube will remind your subscribers coming back for more. 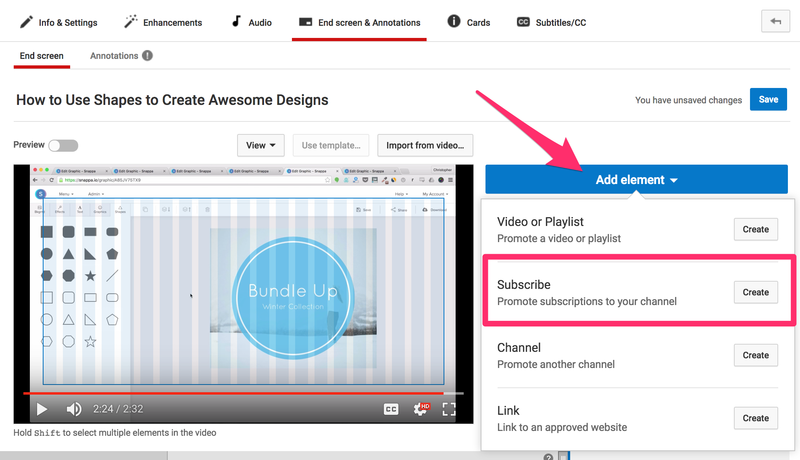 Getting viewers to subscribe to your channel can be as easy as asking them to. At the end of all our videos, we asked viewers to rate, comment, and subscribe. To be even more effective in gaining subscribers, prompt them to subscribe right on the screen. 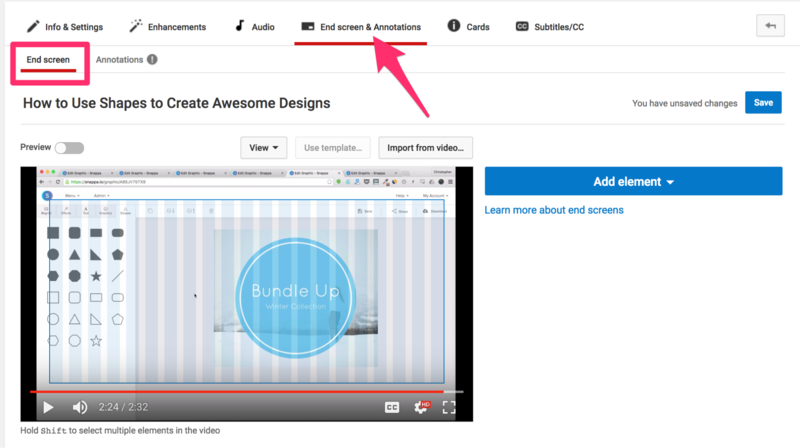 To do so, click on “End Screen & Annotations” and make sure you’re on the “End screen” sub-heading. Then click “Add Element” and choose the “Subscribe” option. As you can see, the potential to build an audience on YouTube is huge. With just 16 videos, we were able to generate more than 750,000 views to our channel. First, perform research and optimize your videos for search. Next, create consistent thumbnails. Then, organize your videos into playlists. Finally, maximize viewer retention and keep them coming back for more. 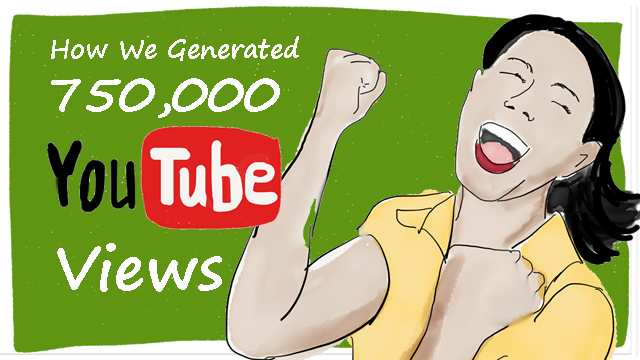 Have you had success generating YouTube views? What’s your biggest challenge? Christopher, this is such wonderful information — what a gift you’ve shared — thank you SO much!! ? Agreed, Kathryn, I’m glad you liked it! I’ll certainly be implementing these tips from now on with the Mirasee channel! I am feeling highly benefited from your post. All the above-mentioned points are highly effective and your step by step explanation just makes me inspired to create a YouTube video of my own. I really love to read this kind of blog where I can find out the maximum for my work. Just one doubt, how long should I write for my video content which gets maximum exposure on YouTube.